Sing-along with Central Florida Community Arts’ youngest performers in the Children and Youth Arts Program as they present Hats: The Musical. A clever rhyming script and sweet catchy songs explore all kinds of hats, their uses and the people who wear them. These performers will discover that it’s not the hat that makes you special, but what’s underneath in production that the whole family can enjoy! 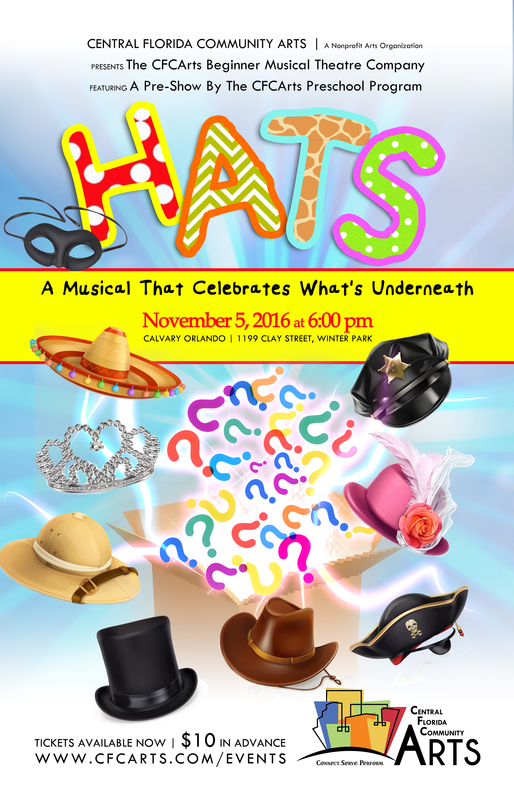 Members of the CFCArts Children and Youth Arts Program will present Hats: The Musical at Calvary Assembly, 1199 Clay St, Winter Park, FL 32789. on Saturday, November 5th at 6:00pm. General Admission tickets are $10 each, and children age 12 and under will be admitted for free. Tickets may be purchased online or by calling the CFCArts Box Office at 407-937-1800 x 710.